PARTS NEEDED. 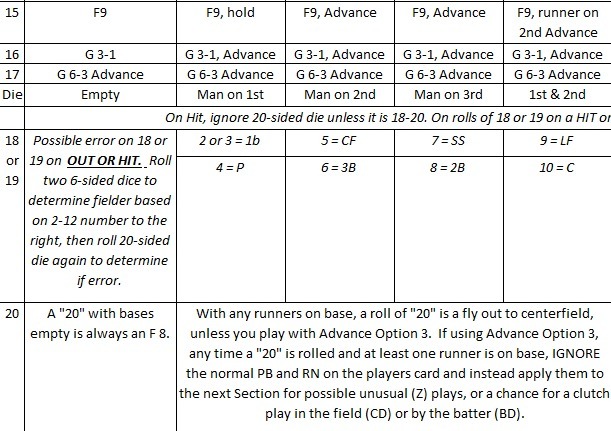 Playing Statis Pro is as easy as A, B, C. The following 2-part tutorial video (Set up of gameinning video then 13th inning of Dominican Republic vs Puerto Rico) gives a quick 10-minute visual of how you play the game based on the basic instructions in this blog and a photo of the setup here. A. Player Cards. You can choose players from this sheet of all projected 2019 players that look like this: . or you can order current cards by clicking here for cards that look like this and contain the same information. The projected 2019 players include 535 pitchers and 521 batters and are adjusted for ballparks so all players perform as they would in an average ballpark. B. Two 6-sided dice are rolled to determine whether to use the pitcher's card or the batters card. The range after the pitcher's PB: 2- tells you what dice combination keeps the action on his card. 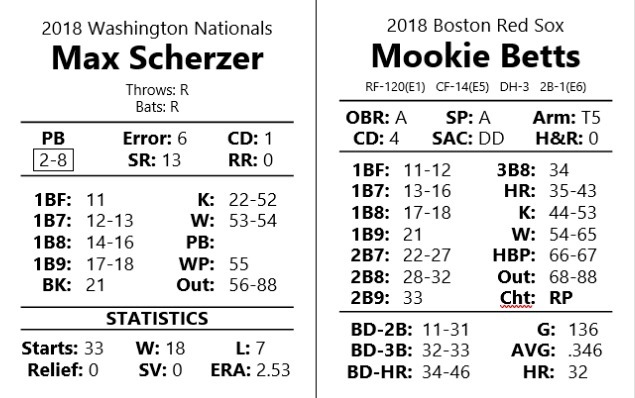 Scherzer needs a roll of 2-8 to keep the action on this card (see both his card and his row above), but in the roll below the combination was a 9 on the blue dice, meaning we use Betts' card. Out = Out - if you do not have a 20-sided die simply record as an "Out" and all runners hold. 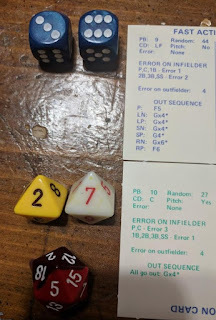 However, if you do have a 20-sided die, then find the column header that shows what bases are occupied, and go to the die number to determine what kind of out occurred (letters mean Grounder, Double Play, Fly Out or Line Out). 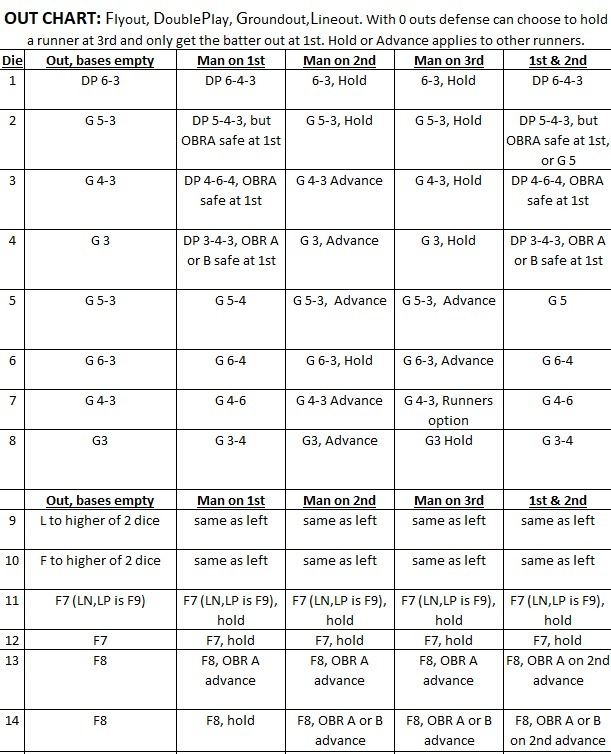 On a roll of a 18 or 19 there could be an error, and a 20 is a flyout out to centerfield unless you are playing advanced rules. If an RHP (Right-handed pitcher) faces an LP or LN (lefthanded batter), then change a roll of 87 or 88 to a single. The same is true if a LHP faces a RP or RN. 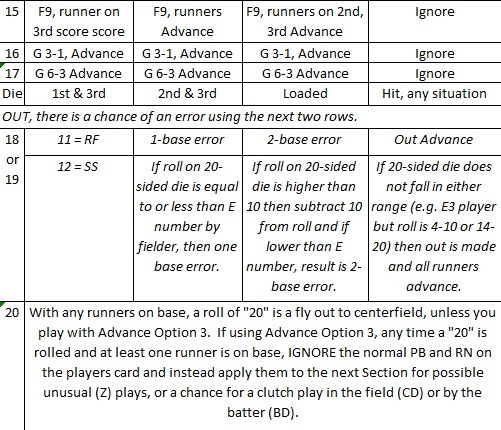 However, if an RHP faces a RN or RP, then a roll of 11 or 12 is changed to an out. If a LHP faces an LN or LP it is even harder to get a hit, as any roll of 11 to 15 is a strikeout. Note that SN and SP batters do not have any adjustments no matter if they face a LHP or RHP. 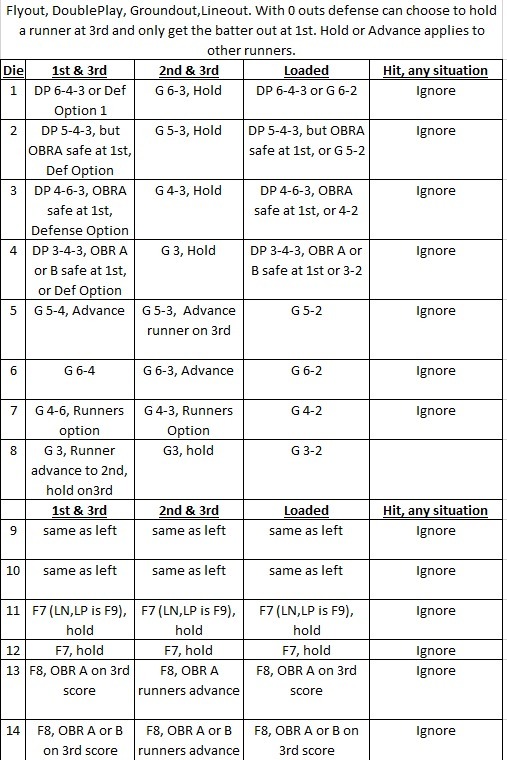 Rather than simply having runners advance as many bases as the batter, you can use their speed (OBR/SP of A to E on the card) to try to take extra bases. When trying to take an extra base on a hit, or steal a base, the runner is only out if you roll a "6." On a roll of a 1 through 5, if his OBR or SP is not good enough to take the extra base, then he just stays on the base. An OBR: E cannot try to take an extra base, and a SP: E cannot try to steal. Just decide which of the three you want to do and roll one 6-sided die instead of all 4 dice. Once a batter is done hitting, and you decide if you want to try to take an extra base, steal or bunt, then go to the next batter. Click here for advanced rules.